Some time around 1550 Piers Hartley built the first stone hall on this site, which consisted of two large rooms that are still standing, either side of the main entrance way. It would have only been a single story building, giving little hint of the grandeur that was to follow. His daughter Elizabeth married Nicholas Cunliffe in 1611, beginning the Cunliffe family’s occupancy of Wycoller Hall for some two hundred years. Elizabeth and Nicholas had five children. Their oldest, John, married twice- his first wife and daughter dying in 1636. By 1638 John married again, to Mary Chetham of Manchester. They moved to the Cunliffe ancestral home at Hollins (near Accrington), where they were to have 11 children. At the outbreak of the civil war in 1642, Nicholas Cunliffe was one of four captains of the Colne Parliamentary troops. After the Royalists were defeated, a Puritan form of church government was set up in Lancashire. Nicholas and his son John participated in this assembly, along with two of John’s brothers. 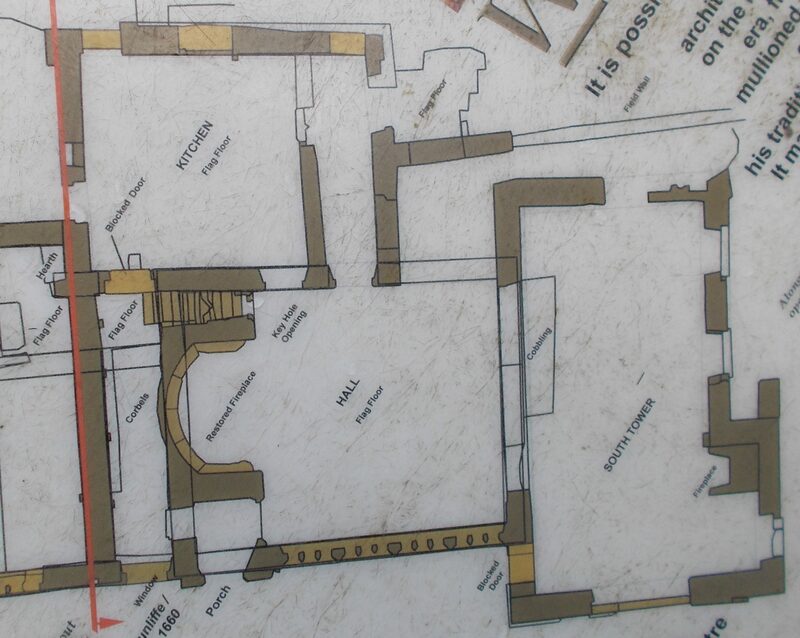 By 1660 a poll tax return shows the hall was now a three storied house. 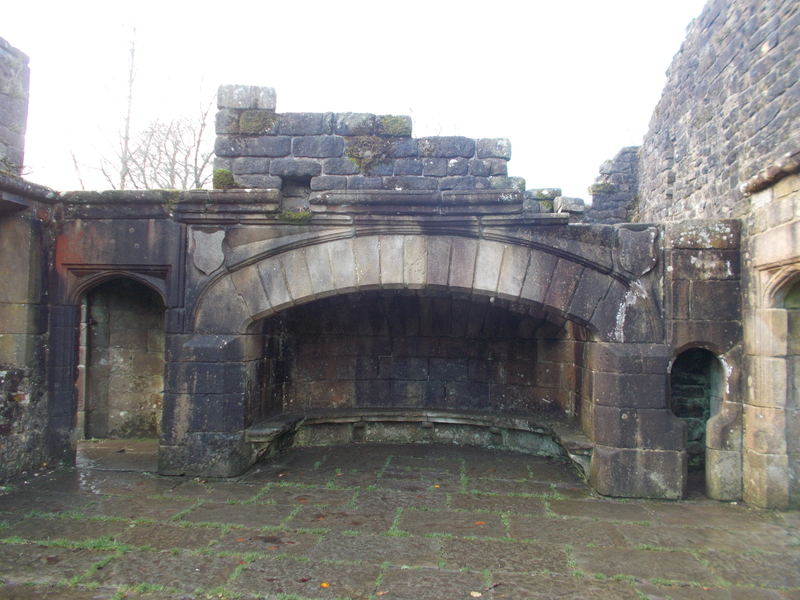 The kitchen area we see today and the south tower probably were in place by then. By this date Nicholas had died but Elizabeth still lived there with her youngest son Ellis. However, the hall had been split into two separate residences. John Pearson and his family were living in the other half. By 1773 the Cunliffe name was all but extinct, after the remaining male descendants died without sons. It was agreed that a relative, Henry Owen, could inherit Wycoller Hall on condition that he took on the Cunliffe name, which he did becoming Henry Owen Cunliffe. At 21 he was young and had ambitions for himself and his new home and estate. He made many of the alterations that we see in the hall today, trying to make it appear grander and older than it really was. The huge fireplace and the long rows of mullioned windows were both added by him, as were new gardens and a grand entrance porch. He also had the aisled barn (now a visitor centre) converted to a coach house. He married Mary Oldham, the daughter of a rich hat manufacturer, who he met on a militia exercise in Manchester. They moved in just as the last of many of the modifications were completed. Sadly, his grand life style was not to last, and led to his own downfall and that of the hall. Whether through overspending, poor business decisions or gambling (or a combination of all three) he accrued huge debts. By the time of his death in 1818 the house was already mostly shut up for much of the year. Some of the blocked doorways we see today probably originate from this time. The building was only being used once or twice a year, on Henry’s visits to the estate to shoot grouse. It may have been around this time that Charlotte Bronte visited, and later used Wycoller Hall as her model for Ferndean Manor in Jane Eyre. She describes Ferndean as having ‘no tenant’ and as in ‘an ineligible and insalubrious site’ and ‘unhabited and unfurnished except for two rooms’ for the squire when shooting. With the death of Henry Owen Cunliffe, his nephew Charles inherited the Wycoller estate. The debts were so great that he would have had little option but to sell off its assets, including those of the hall. Doors, windows, building stone, roof timbers, flagstones were all valuable and reusable items. 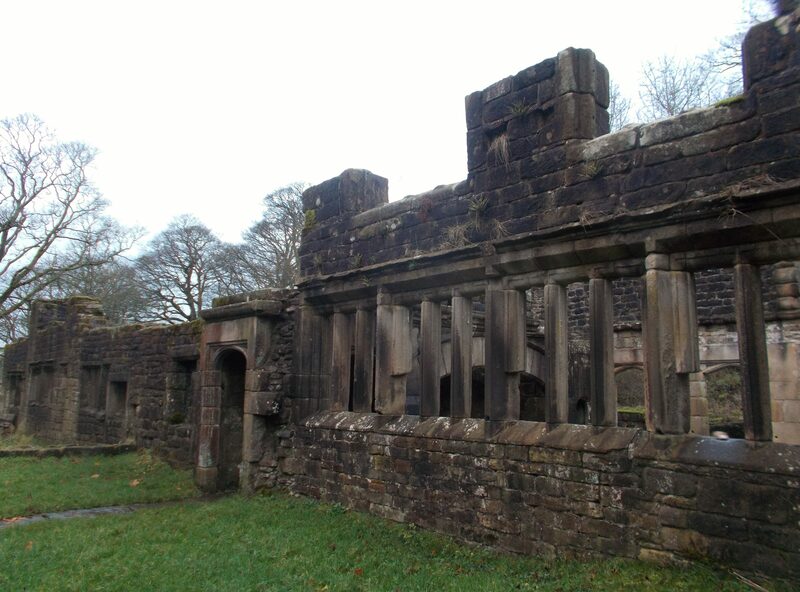 Henry’s grand porch was dismantled and rebuilt first at Trawden, and then moved a second time to Ball House in Foulridge. Colne Corporation bought the estate in 1896, with plans to flood the valley and create a reservoir. Fortunately this did not happen, as the creation of a local bore hole produced enough water for the area. Under the stewardship of the local water board over the next few decades the village fell into ruin. Much of the remaining parts of the hall collapsed in 1946, but this triggered a positive response from local people. 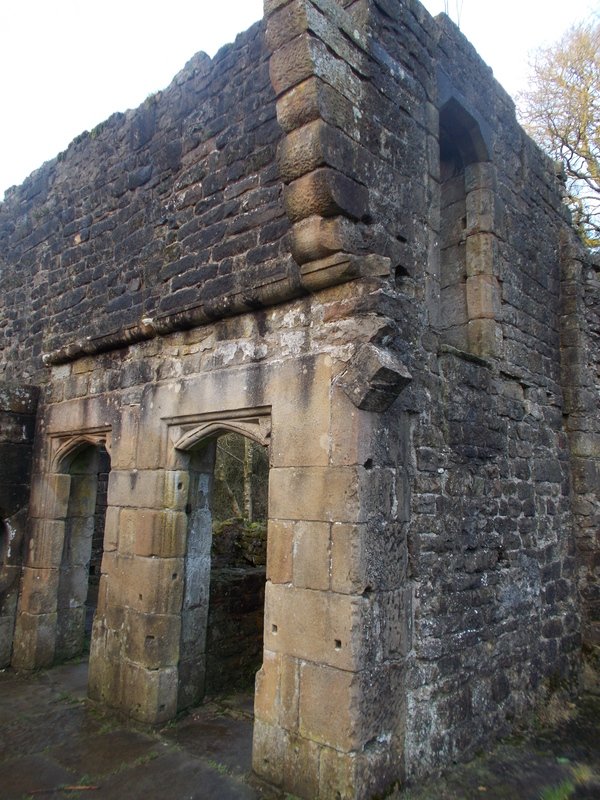 The Friends of Wycoller was formed, and with other local societies repaired some of its features – such as the large fireplace and keyhole cupboard next to it. In 1973 Lancashire County Council took over the estate, and created a country park at Wycoller, consisting of 350 acres . 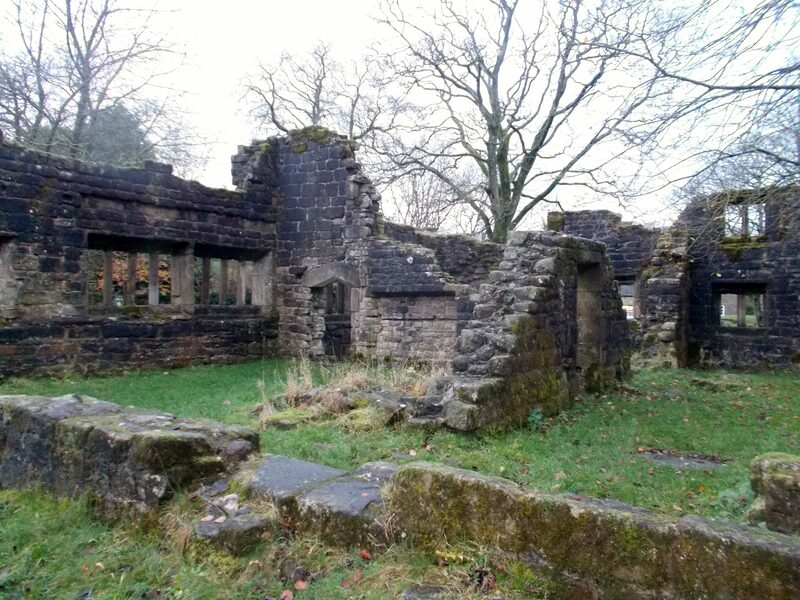 The hall ruins became a scheduled monument and Grade II listed building. The aisled barn was converted into a visitors centre. What was once a neglected, run down village is now a charming and picturesque place to visit at any time of year, with much to see. As well as the three historical bridges (the clam, clapper and packhorse) a more recent edition is the panoptican on the hillside, near the Haworth Road car park. There’s also a walker and dog friendly café just a short distance from the hall. 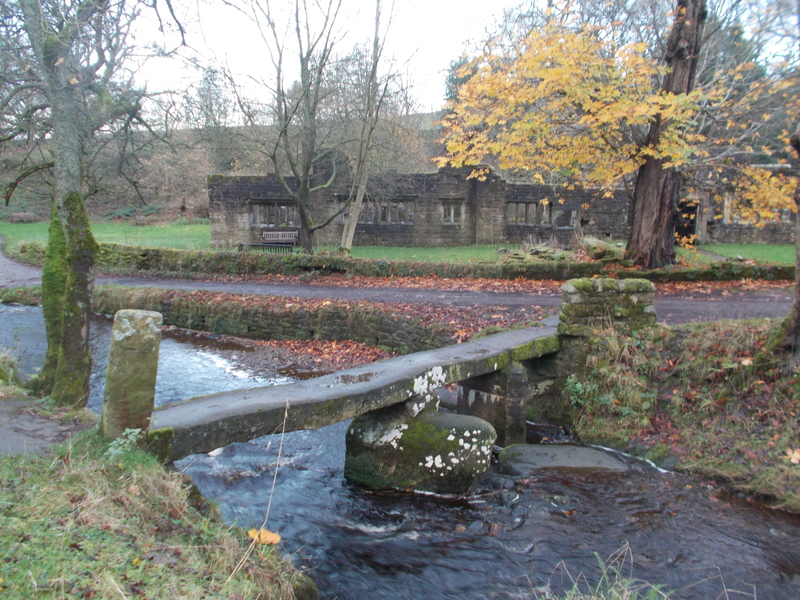 Do visit the Friends of Wycoller website (www.friendsofwycoller.co.uk) by clicking here. It contains a wealth of information, and on its ‘downloads’ page (click here) you can get a whole range of leaflets in pdf form on walks, history and wildlife of Wycoller. Guide to the ruins today: Go in through the front entrance way in the middle of the building. This brings you into the oldest part of the hall, one of its original two rooms. The large fireplace built by Henry Owen Cunliffe and restored in the 1950s is the most prominent feature, with its unusual key hole shaped cupboard next to it. Also note the huge rows of mullioned windows, also put in place by Henry. To get behind the fireplace, head for the small corridor, just to the left of the entrance way. If you ascend the steps, you can look out over the main hall room- but these have to be the most worn steps in Lancashire, so take care ! Return to the main hall via the narrow corridor. Head to your right to enter the south tower, once three stories high. To visit the kitchen area, return to the main hall room and head through one of the two doorways by the fireplace. The rooms you’ve just visited on the right hand side of the hall comprise the half of building that Elizabeth Cunliffe lived (as a widow), around 1660. To visit the left hand side of the hall, the half occupied by John Pearson and his family, turn left out of the kitchen area. Here are a number of rooms (whose functions are unclear). At the front of this part of the hall is a room locally called ‘the chapel’, which has a possible altar in it. 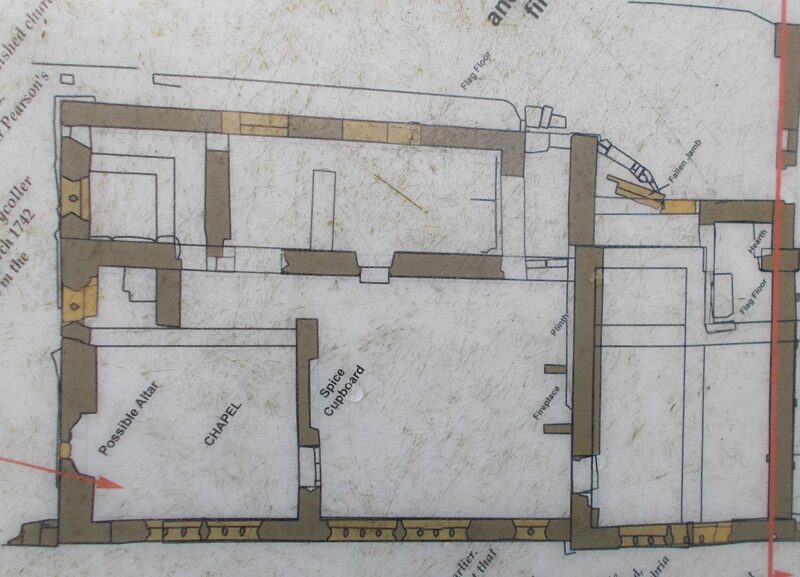 The two photos of the plan of the hall to the left of this text can be enlarged. Just double click on them and then wait a moment for them to adjust to normal size. Park either side of Wycoller Country Park at Haworth Road Car Park or Trawden Road Car Park. Parking is free. Entry to the hall and aisled barn is free and the site is open all year.